The Spurs have been depending on Kawhi Leonard to carry the team to wins this year, but that doesn’t work when the rest of the team isn’t really playing. Sometimes it feels like the Spurs have become a one man team this year, and when everyone else plays poorly, they’ve depended on Kawhi Leonard to bail them out for a win. This afternoon, the guys in Silver and Black found out the limits of that strategy, when a dominant game from Leonard wasn’t enough to pull out a win against a Knicks team that had been reeling from all kinds of drama—involving players, former players, and even the team’s owner. Tonight, the Knickerbockers came to play basketball, and the Spurs didn’t. They prevailed with good performances from their superstars—Derrick Rose, Carmelo Anthony, and Kristaps Porzingis—but the difference may have been a strong game from Willy Hernangomez, on just his second start, scoring 12 points and making key defensive plays. The Spurs still had a chance late in the game, trailing by just two points with three minutes left, but a key turnover by Patty Mills effectively ended the comeback, turning a 3 on 1 Spurs fast break into an open three for Anthony. Essentially a 5 point mistake. The Knicks hung on for the win, with Carmelo and Rose hitting key baskets down the stretch and the Spurs missing everything. The game started off with the Spurs dominating the boards, and even though they couldn’t shoot worth a damn, they were able to slowly add to their lead as the Knicks seemed willing to let the Spurs control the game. 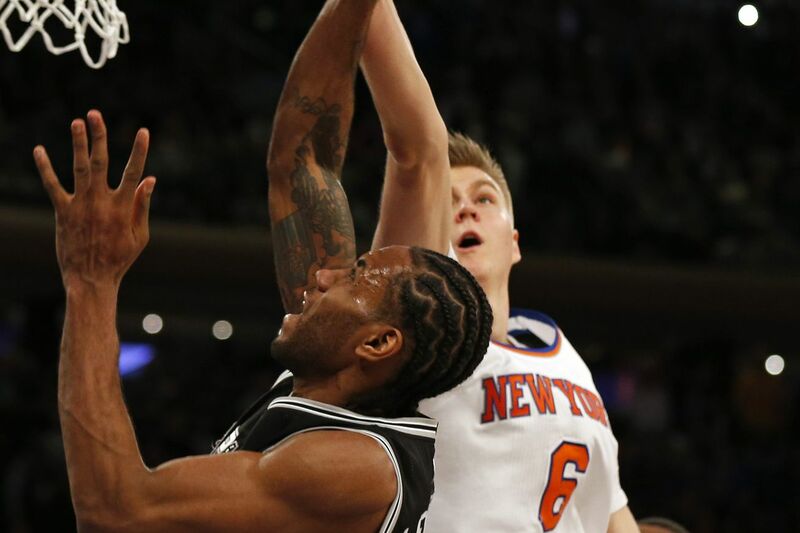 But Kawhi was out of sorts and he had trouble with getting open shots over Kristaps Porzingis, who stymied him with his length. But nevertheless, the Spurs were able to build a cushion, leading 48-36 with just over two minutes left in the half. It was looking like a game that the Spurs might win despite their listless effort. But the Knicks finished the half strong with a 6-0 run led by Derrick Rose driving strong to the basket. Despite taking a league low 29 shot attempts in the first half, the Knicks were only down by six points going into the locker room, 48-42. The Knicks started the second half as they had finished the first. Playing aggressively and taking the ball to the Spurs, they scored the first 9 points of the third quarter and led 51-42. At the start of the game, the arena had been eerily quiet, but the Knicks run gave them energy, and the Knicks fed on it, too. Kawhi finally got into the game and began to pull the Spurs back into it, singlehandedly evening the score again and again as the quarter wore on. But the Spurs shooting was cold again, and the Knicks scored the last 4 points of the quarter and led 69-65 going into the final quarter. This still felt like a game that the Spurs were going to win, given the Knicks’ uncanny propensity for losing close games, but they persevered throughout the final 12 minutes. The Spurs were surging late and looked like they had a chance to steal the game with 2:54 left as Patty Mills stole the ball from Derrick Rose and took it up the court for a fast break. But he lost control of the ball, right into the hands of Courtney Lee who passed the ball to a wide open Carmelo Anthony who sank the three point shot. What looked like it was going to be a tie game was suddenly a 5 point lead for the Knicks. The Spurs did what they could to close out the game, but the Knicks, led by Carmelo and young Willy Hernangomez hit their shots to close out the game, and the Spurs missed theirs. Game over, man, game over. This one felt like the Spurs gave one away, but that doesn’t give enough credit to the Knicks, who took advantage of every opportunity that the Spurs gave them. Kawhi Leonard is so damn good that 36 point game from him feels just average. He was only 1-9 from 3 but everything else about his stat sheet was spectacular, including 4 steals. Kristaps Porzingis was doing a really good job defending the rim tonight. He’s not usually known for this defense, but he was great tonight, and he really bothered Kawhi for much of the game. Kyle O’Quinn gave the Knicks some great minutes tonight. High energy and very strong, he took rebounds away from Danny Green and Dewayne Dedmon in the second half. He didn’t score much, but he was a key contributor for them. A few days after his best game as a Spur, Dedmon had one of his worst. He wasn’t getting the wide open looks at the basket he got against Detroit, and he was kept in check by the tall front line of Hernangomez and Porzingis. Like every young player, he’s going to struggle with consistency, so I’m not too worried about him in the long run. Patty Mills had a terrible game, and he’s had a few of those recently. The terrible horrible very bad day was capped by the inexplicable turnover late, but I don’t think it’s something that’s going to hurt him long term. If there’s anything I’ve learned from watching Patty over the years is that he always overcomes adversity and comes back stronger than ever. Let’s hope it’s sooner, rather than later. Lamarcus Aldridge settled for midrange jumpers all game long and couldn’t hit anything. He’s just been so inconsistent this year. He’s an athletic guy with a big body who can dominate inside, but he declines to do it most of the time. It works if he can hit a high percentage of midrange jumpers, but when his shot is off, it’s not good, especially since long rebounds off some of the missed shots in the second half led to runouts and easy points for the Knicks. This game gave me a sense of deja vu, remembering the March 17, 2014 game against the Knicks which ended up costing them 3 spots in the playoff seeding, leading to an early exit. Hopefully, this loss won’t be that costly. Davis Bertans did a pretty decent job on Porzingis, and it was great to see two Latvian players matched up on each other. I’m not sure why Pop went away from that. Not everybody on the Spurs not named Kawhi was terrible. David Lee had a pretty good game on offense, although he’s not a rim defender, which probably limited his minutes. The Spurs record is now 41-13 and they are in second place in the Western Conference. Their record on the Rodeo Road Trip is now even at 2-2, and they have 4 more games to play before they return to San Antonio, starting tomorrow night at 6:00 pm against the Pacers on FSSW. [NOTE: corrected time] Then they go to Orlando on Wednesday to play the Magic at 6:00 pm in their last game before the All Star Break.